Custom Magnetic Ribbon Clips Personalized in Bulk or Blank. Promotional, Inexpensive. Bulk Magnetic Ribbon Clips , personalized with your logo. 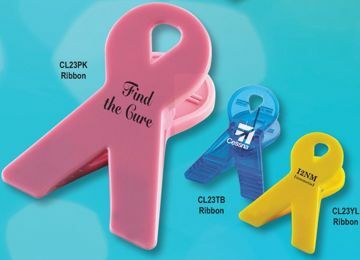 Good causes, such as Cancer Awareness campaigns, can benefit from these useful ribbon magnetic clips. Each has a super-strong magnet in the back. 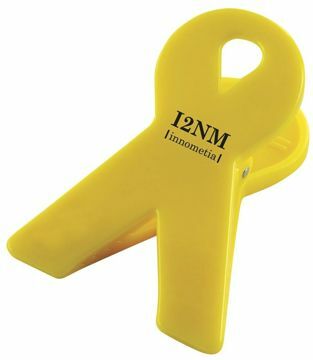 This item qualifies for Quick.We also supply blank (not imprinted) Ribbon Paper Clips for $0.37 each. Budget Prices in the USA and Canada for wholesale Magnetic Ribbon Clips . Free artwork design. US clients pay no taxes. We will send you a proof for your approval before production. Price includes a 1 color, 1 side imprint. Colors: Translucent Blue, Solid Yellow, Solid Pin (see photos). Assortment is allowed. Imprint Area : 4/4" x 1/2"
Typical Production Time: 7-10 days after art approval; Rush 1 day production is available: contact us.